If you have a Fedora 17 install and updated recently (since saturday), you may or may not have noticed that the updates-testing repo is now disabled. If you are not interested in testing things out, and want to just have your install more or less as it will be when it’s released on the 22nd, you may want to run a ‘yum distro-sync’. This should downgrade your packages to the base versions from any you have installed from updates-testing. If you don’t do this you may run into odd problems about packages not available or mismatches when trying to install 32bit packages on a 64bit install or the like. http://repos.fedorapeople.org/repos/kevin/xfce-4.10 for a repo file for your /etc/yum.conf.d/ directory. Lots of nice new little bugfixes and additions in Xfce 4.10. Give it a try today. Yesterday, we finally had to make the decision to send Merlin on his way. It never gets any easier to make that decision, but once again, I think we made the right one at the right time. (At least I keep telling myself that). 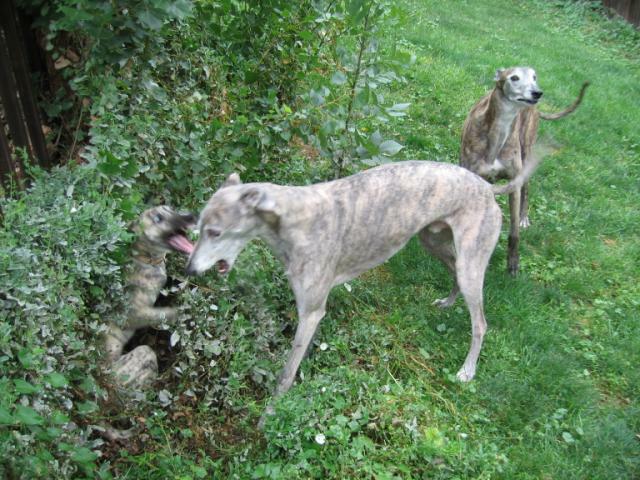 Merlin was a beautiful blue brindle (one of the rarest colors of greyhounds) boy. His owners had high hopes for his racing carrier, but it never went anywhere, and he retired when he was only 18 months old, having never run an official race. 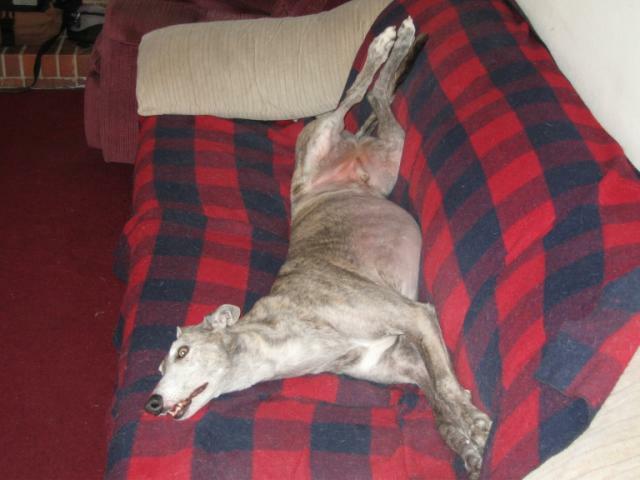 He went into his life of retirement to a great place: a family where he learned all the obedience commands (He had his Canine Good Citizen Cert), dog agility, and how to teach other greyhounds how to live in a home. 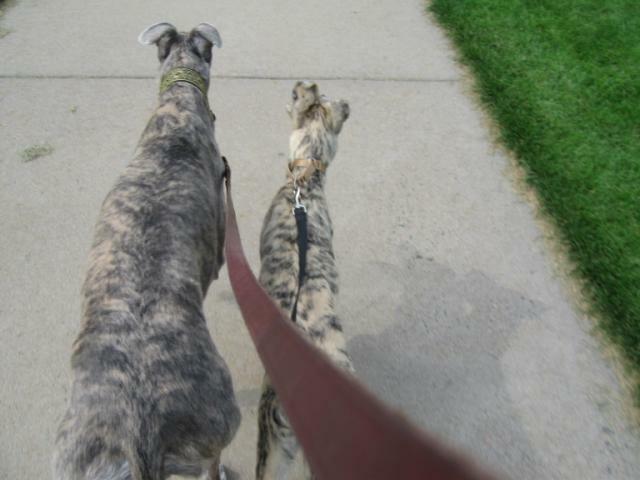 He also helped raise a bunch of greyhound puppies over time, keeping them in line and showing them the ropes. 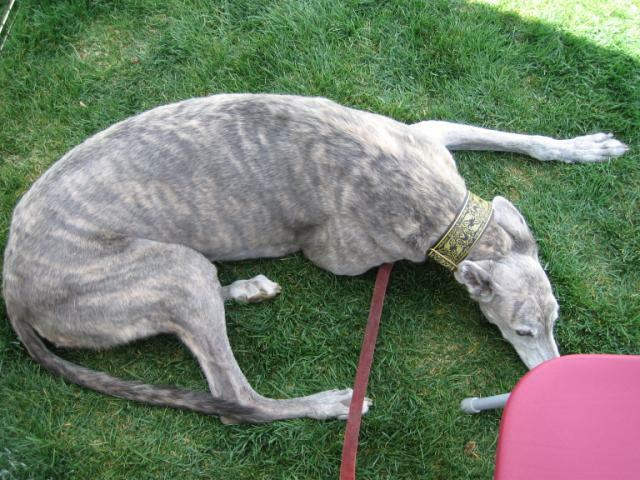 When I first moved to Colorado and thought about adopting a greyhound, I went to a meet and greet and there he was. So handsome, soft and alive. 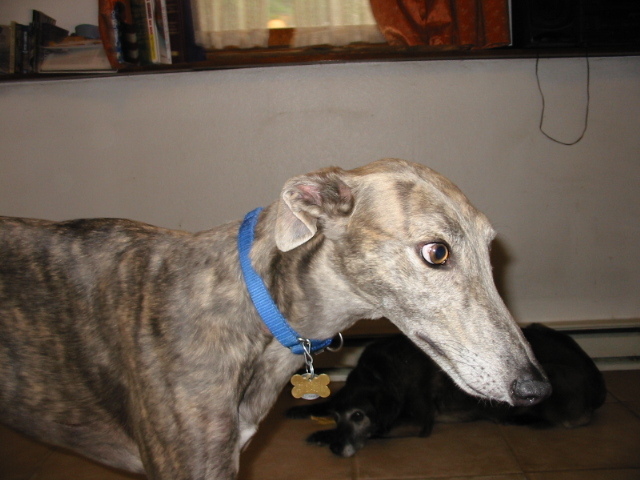 He was the first greyhound I met in colorado and the one that sent me on my way adopting and fostering. Then, when he was around 5, he came to me. At first he was afraid. He had major seperation anxiety anytime I left the house, but soon he learned that I would ALWAYS come back to him. He became my velcro dog. If I went upstairs, so did he. If I went on a trip, he wanted to go too. Here too he showed foster dogs how to run up stairs, play with stuffed toys and enjoy life. 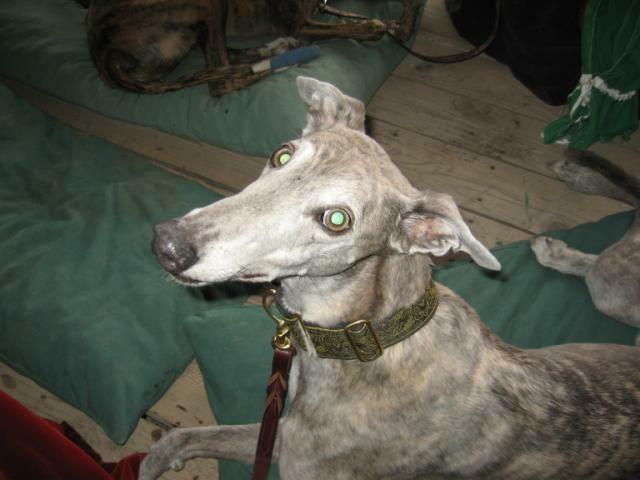 We spent many many many days out at the greyhound booth at the ren faire. Merlin didn’t really care about being there or the people or attention out there, he just wanted to be with me (and later Wendy as he bonded with her too). 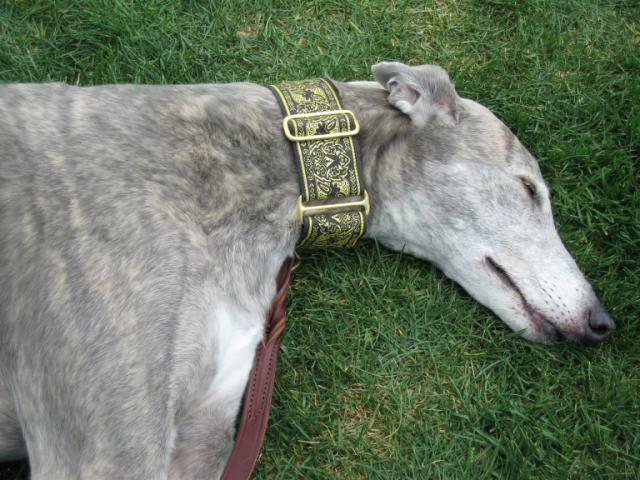 While at the booth he would hang back and sleep and lay down, not caring too much about people petting him. When we would leave the booth, he would move up front, scanning the crowds until we returned… jumping for joy at our arrival (literally). Last year he was diagnosed with a thymoma in his chest. 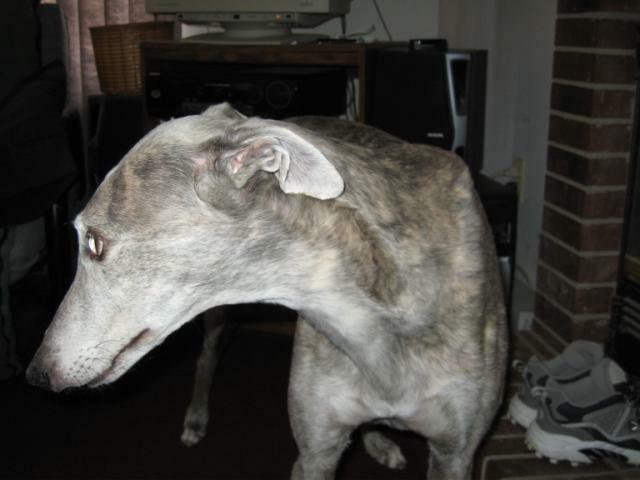 They didn’t give too good a chance, but we looked in his eyes and saw that he was going to stay with us, so he had a 4+ hour surgery and they removed a double fist sized thymoma from his chest. Amazingly he recovered and got another year to spend with us. He still tossed stuffed toys around and would from time to time run around the yard. Good bye Merlin. You touched more lives than you can know. I will never forget you. First the fftw package decided to reorg how it’s subpackages were setup. (IMHO not a great idea right before release). The version in updates-testing is one libs package, but the base version is a bunch more subpackages. Next you may run into colord-gtk issues. colord grew a new colord-gtk subpackage (IMHO not a great change right before a release either). I’ll try and update this post with any more of these I find… feedback welcome.